Pythium root rot may affect a few plants or can cause the loss of a high percentage of plants, usually soon after the transplant of cuttings. 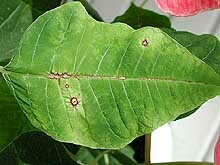 Wilt and death result when infection is severe. Any surviving plants may be stunted, flower prematurely, and defoliate. Pythium species may enter greenhouses through infected cuttings, contaminated soil within or outside the greenhouse, or contaminated irrigation sources especially surface waters. The pathogen has also been shown to be present in peat moss or soilless media in some cases. Sub irrigation or ebb and flow systems can cause rapid spread when wet soils persist for long periods or floors do not drain completely. Treatment of irrigation water may become necessary. Pythium species should be excluded from the production system. High soluble salts can lead to root injury, further disposing the plants to Pythium root rot. Pythium is favored by high fertility and high moisture; avoid overwatering and overfertilizing. Pythium is a natural inhabitant of the soil and can survive there indefinitely as well as in soil and debris in the greenhouse. Use soilless growing media. Keep hose ends off the floor and avoid contaminating growth medium with soiled hands, tools, or flats. Biological control agents can be incorporated into growing media before or during transplant. Fungicide drenches can also be applied preventively. See Root diseases of Greenhouse Crops (from this list) for appropriate fungicides. Botrytis cinerea can cause leaf and flower bract blight as well as stem cankers; the pathogen must be controlled throughout the greenhouse as it can attack a wide array of greenhouse crops. The fungus readily invades wounds and all plant tissue, especially senescent or injured plant parts. B. cinerea requires high relative humidity and cool temperatures. It produces large amounts of spores easily visible as a gray mold which are easily spread on air currents or splashing water. The pathogen is ubiquitous in the environment and can only be controlled by a combination of management of environmental conditions, sound cultural practices, and fungicide applications. Control weeds, remove plant debris, and avoid damaging plants. Space plants to allow good air circulation, reduce humidity within the canopy, and minimize leaf wetness. Improve horizontal air flow with fans. Reduce humidity by a combination of heating and venting in the evening, particularly when warm days are followed by cool nights. Fungicides should be applied with caution as application to bracts can cause spotting, bleaching, or leave an unacceptable residue. See Botrytis Blight of Greenhouse Crops (from this list) for registered fungicides. Powdery mildew (Oidium species) was first seen in US greenhouses in the 1990s and has since occurred sporadically. White colonies occur on both on leaves and flower bracts, reducing aesthetic value. 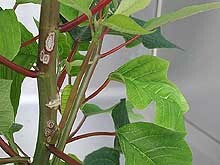 The pathogen is not likely to survive in northern climates unless it is carried over on poinsettias in greenhouses, but it can be introduced on infected cuttings. The high temperatures of the summer months limit its growth. Powdery mildews, unlike most other fungal diseases, do not need free water to germinate and infect. They are favored by high relative humidity (greater than 95%), moderate temperatures (68°-86° F), and low light intensities. Careful scouting can allow timely fungicide treatments, but great care in fungicide applications is necessary to avoid possible flower bract injury. See Powdery Mildew Diseases of Ornamentals (from this list) for fungicide choices. Two species of Phytophthora cause root, crown, leaf, flower and bract blight. 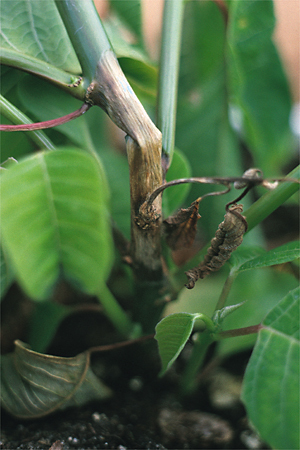 Brown infected roots may be present before stunting and wilting occur. Infections on crowns and stems occur as purple black lesions that enlarge rapidly. Leaf and bract lesions appear dry and papery, grayish brown to black. Phytophthora species should be excluded from the production system as control is difficult to impossible. Pathogen-free plant material and growing media coupled with strict sanitation form the backbone of a prevention program. 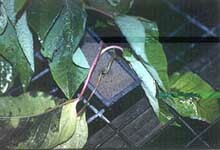 Contaminated irrigation sources especially surface waters may introduce and spread Phytophthora within the greenhouse. Sub irrigation or ebb and flow systems can cause rapid spread when wet soils persist for long periods or floors do not drain completely. Treatment of irrigation water may become necessary. Biological control agents can be incorporated into growing media before or during transplants. Fungicide drenches can also be applied preventively. See Root diseases of Greenhouse Crops for appropriate fungicides. Rhizoctonia root and crown rot can result from the transplant of infected cuttings. 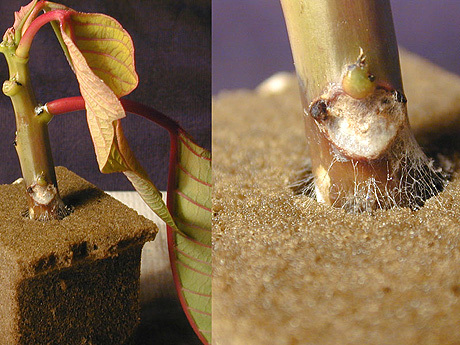 Stem lesions develop more slowly on rooted plants. Symptoms include brown, water soaked roots, leaf yellowing, wilting, stunting, defoliation, and plant death. This pathogen prefers drier soil and is more active in the upper portion of the soil. It is favored by high nitrogen, high moisture levels, and high relative humidity. The disease is usually a problem in the cuttings and small transplant stage and the presence of wounds caused by insects (fungus gnats, shore flies) or mechanical damage can predispose plants to Rhizoctonia infection. The pathogen is easily introduced into the growth medium by soiled hands, tools, flats, and colonized transplants. Optimum control of Rhizoctonia is achieved with cultural practices and fungicidal control. Start with thorough removal of all crop debris and sanitation of benches and work areas. Use soil-less growing medium and clean pots and flats. Keep hose-ends off floors as Rhizoctonia can persist in soil and debris on concrete floors. Avoid over-irrigation and over-fertilization. Avoid close plant spacing that results in moisture and temperature levels favorable for disease development. 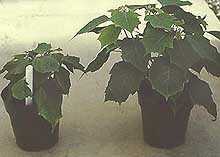 Biological control agents can be incorporated into growing media before or during transplants. Fungicide drenches can also be applied preventively. See Root diseases of Greenhouse Crops for appropriate fungicides. Benson, D. M. et al. 2002. 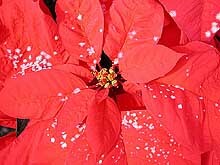 Poinsettia: The Christmas Flower. APSnet. 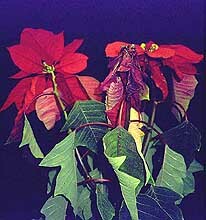 http://www.apsnet.org/publications/apsnetfeatures/Pages/PoinsettiaFlower.aspx.